This illustration helped me preserve my sanity back in 2001 when Sun Microsystems began a series of gyrations that culminated in the shedding of senior employees. It was an amazing inspiration to me and remains so today. I am trying to locate the illustrator so I can order copies of this illustration and give the artist appropriate credit. 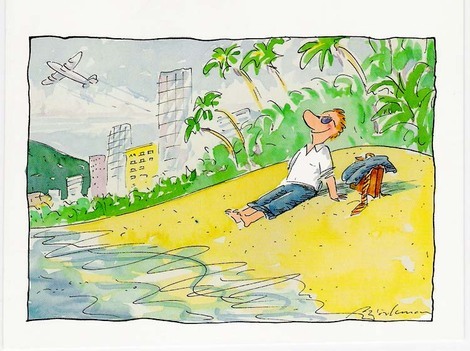 I saw this as a portrayal of a businessman opting out of the frenzy of corporate life, discarding shoes, tie and briefcase to sit barefoot on the beach in the afternoon sun. His plane is taking off without him and he is happily contemplating an alternative future. I found this illustration on a greeting card and it jumped out at me as a more desirable life than the one i was living. I though how great it would be if I could experience that feeling of freedom. I didn’t know how soon I would get to see it firsthand. Within a short period of time, I and 450 other senior employees were jettisoned from Sun. I knew that at age 67, I needed a change of venue, because my 50-year-old compatriots were getting rebuffed at every turn. Gretchen and I spent a long weekend in Pacific Grove deciding what I was going to do for the rest of my life. The result was the beginning of my post-corporate existence. This illustration has hung over my desk as a reminder that separating from a group is not the end of life. It can be the beginning of a new and better one. The trick is finding a game that you really want to play, and staying away from games that are controlled by those who crave power. If I were to put a caption to this illustration, it would be: "This is the life! Sometime soon, maybe next week, I should find an internet connection… :)"
If anyone can identify the illustrator, I would be very appreciative. What If I’m in my mid 30s and still have’nt made my million dollars, still very far from having a beach house or yatch. Do I still qualify to opt out? or Does that make me some kind of loser? 😉 just pulling your leg. Fantastic drawing, I can feel the surf at my feet as the rest of the world is busy at work. You can just think of it as a reminder that hard work and no play will leave you high and dry when the company you work for switches directions and outsources your entire department after years of dedicated effort. At 30, you have a much better chance to opt out than you will when you are 55! Quite frankly, opting out often means going with a start-up, and that’s best done while you are younger and can get re-employed quickly if the start-up bombs. Always make sure you make time for family and friends, no matter how critical your project is, or how hot your start-up is. David, pardon my questions… Just curious, what is your current age? You once wrote that you were in the army. Again… just curious, in which wars did you participate? Read the article again and do the math. I enlisted during the interval between Korea and Vietnam. After completing my training, I spent years in the Reserves while working for Aerospace companies. Ah…I haven’t even started working and I already feel like opting out. I have attended a few business events and I have experienced how business people can be like…maybe I should change to medicine? But isn’t the main reason to work is to earn money? I should endure until I have enough money to live off the passive income. Zachary, you have cut right to the chase. The primary reason to work is to make money, so you and your family can have food and shelter. If you can find a work that you enjoy, life is good. As for switching to medicine or to acadamia, both of those professions make most businesses look camparitively sane. Stick with something that produces a recognizable and valuable product or service, doesn’t have a caste system to stop your advance, and has a minimum of govermental interference.